The TM2 SuperPod Large Tripod is 5 ft high with its legs extended fully. It is 21 inches high when the legs are compressed. When the MP1B is mounted on a TM2 Large Tripod with its legs extended fully, the tip of the antenna is 12 feet high. The TM2 Large Tripod can also be used when the legs are collapsed down to 21 inches, and this total height to the tip of the antenna is 8 feet 9 inches. 2 Extension Rods with Coupling. Super Antenna Systems Corporation, in Silicon Valley California USA, is the sole source of genuine Super Antennas. Super Antenna products are sold through authorized dealers and radio stores worldwide. Our products are well known for high performance and extreme portability. Within the past few years, all Super Antenna products have been re-designed for higher precision by American professional RF engineers, mechanical engineers, and materials scientists who are also radio operators familiar with field operations and High Frequency communications. The staff at Super Antenna takes pride in their work and the quality of the manufacturing which goes into the products. We sincerely appreciate your business and providing high quality antennas for you that last a lifetime. Look for this logo wherever quality radio products are sold. © 2015 Super Antenna Systems Corp. All rights reserved. Super Antenna® is a registered trademark of Super Antenna Systems Corp.
are trademarks of Super Antenna Systems Corporation. Products and Intellectual Property are protected. Patented and Patent Pending. NewSuperAntenna is the Official Super Antenna Systems Corporation website. Super Antenna is the Manufacturer of Antennas for Amateur Radio Ham Radio Portable Mobile DXpedition Expedition Apartment EmComm Base Stations Pedestrian Mobile. 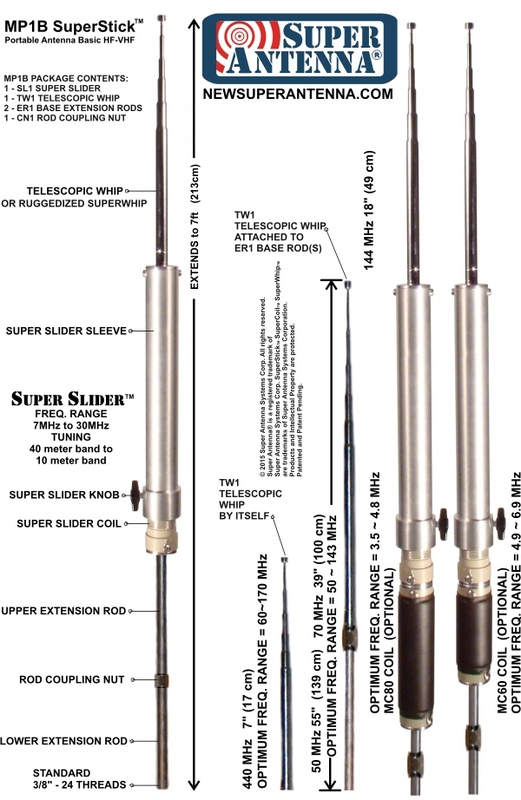 Super Antenna MP1 Antenna is an HF-VHF-UHF Antenna made by Super Antenna Systems Corporation. Super Antenna MP1 SuperStick Antenna is an HF Portable Antenna and VHF-UHF Portable Antenna made by Super Antenna Systems Corporation. Super Antenna MP1B is an HF VHF UHF Antenna made by Super Antenna Systems Corp.
Super Antenna MP1R Antenna is a ruggedized Portable/Mobile antenna made of super flexible titanium and aircraft aluminum by Super Antenna Systems Corp.
Super Antenna SW1 SuperWhip is a ruggedized Portable/Mobile antenna whip stinger made of super flexible titanium by Super Antenna Systems Corp.
Super Antenna TM1 Low Profile Tripod SuperMount is a compact small collapsible portable antenna tripod with coaxial mount made by Super Antenna Systems Corp.
Super Antenna TM2 SuperPod Large Portable Tripod is a collapsible portable antenna tripod, that comes with with a black nylon carry case, it has a 3/8"-24 male stud fitting which requires a separate optional UM2 SuperMount or UM3 SuperMount for attaching an antenna and coaxial cable; the TM2 SuperPod is made by Super Antenna Systems Corp.
Super Antenna Accessories are manufactured by Super Antenna Systems Corporation. SuperBeam SuperPole SuperWhip SuperStick SuperPod SuperMast SuperWire. Super Antenna Systems Corporation is the sole global manufacturing and distribution source for genuine SuperAntenna products. newsuperantenna.com is the Official website of Super Antenna Systems Corporation. 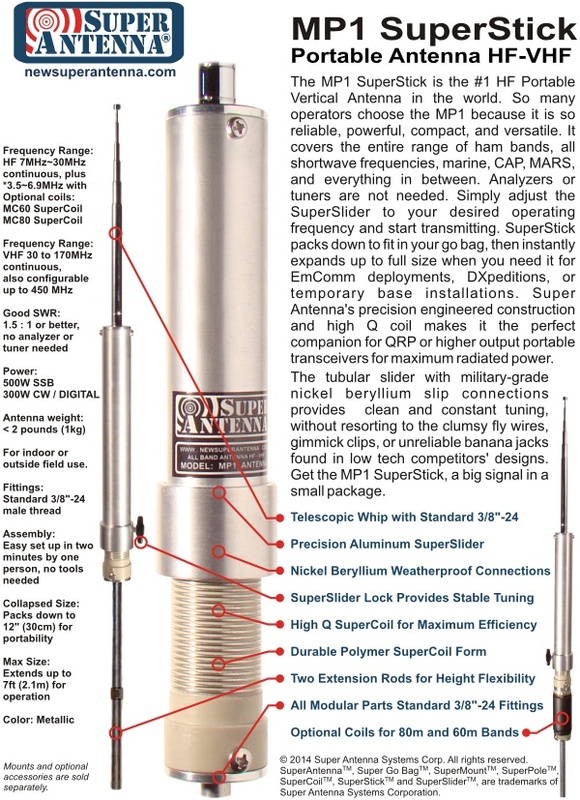 SuperPole is a rotatable HF-VHF Dipole. SuperBeam is a Yagi 3 Element HF VHF Beam antenna. SuperWhip is a mobile whip antenna that is collapsible for travel. The SuperAntenna MP1 is a portable vertical antenna. The SuperAntenna MP1 has coverage of the frequency range 7MHz to 450MHz, and this frequency range is extendable to additional bands by using optional Super Antenna MC SuperCoils. The SuperAntenna MP1 features the SuperAntenna SWR SuperSlider Coil. The SuperAntenna MP1 has High Efficiency. 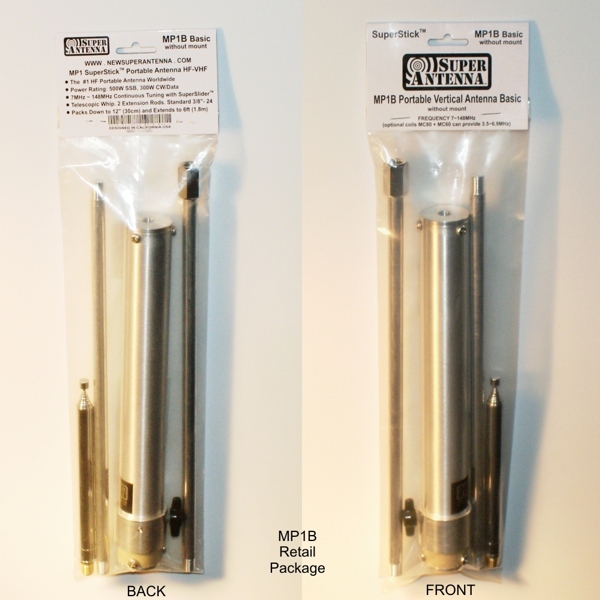 The SuperAntenna MP1 antenna is a Packable System. The SuperAntenna MC80 SuperCoil Option extends the range of the MP1 and DP series antennas to cover 80 metres. The MC60 SuperCoil option extends the range of the MP1 series of antennas to cover 60meters. The SuperAntenna RM1 Transceiver Antenna Mount is a metal mounting bracket for attaching antennas to the side of a radio case. All types of HF portable antennas are made by Super Antenna Systems Corporation. The SuperAntenna TM1 Tripod is a small packable low profile tripod to support the MP1 Portable Vertical Antenna and other types of whip antennas. The Super Antenna YP3 SuperBeam is a portable yagi beam antenna. The Super Antenna YP3 SuperBeam is a 3 Element Beam with Directional Gain. The Super Antennas MP1 has High Efficiency. The Super Antennas YP3 includes and covers the 20m, 17m, 12m, 10m, or 6m bands; it has a Field-Configurable Band System. The Super Antennas MP-1 has High Efficiency. Super Antenna Systems Corporation is a manufacturer of HF portable antennas for the ham radio amateur radio and HF SSB communications market. The SuperAntenna TM2 TRIPOD is a large portable tripod to support the MP1 Portable Vertical Antenna and other types of whip antennas.